Brazilian songstress Kenia's beautiful, sultry voice invites you to revisit some familiar tunes and meet new songs - from gorgeous ballads to upbeat Brazilian forro, with some cool jazz on the side. She is renowned for her ability to translate the complex rhythms of her homeland into jazzy creations that embody the best of the Brazilian sound –deep and sultry, richly diverse, unexpectedly explosive. 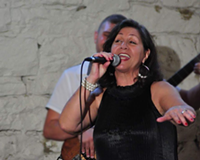 Kenia is joined by a trio of Pittsburgh's most talented jazz musicians: Eric Susoeff on guitar, Tom Wendt on drums, and Tony DePaolis on bass.